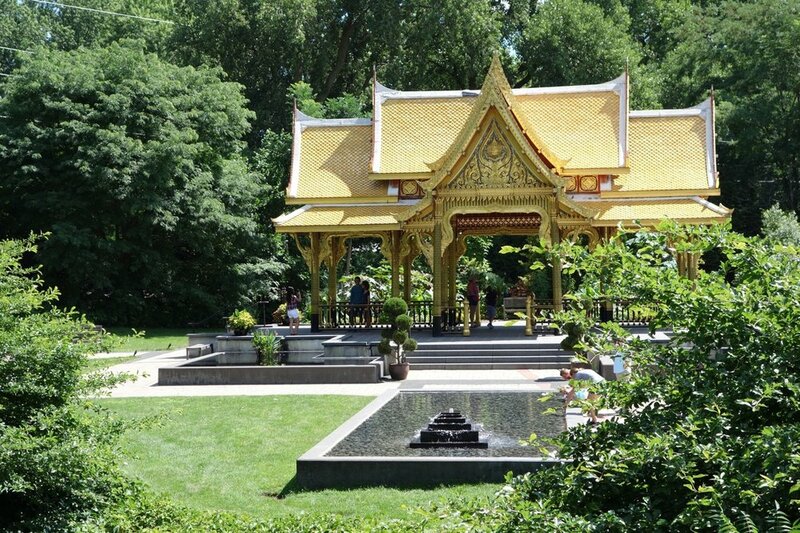 Visiting the Thai Pavilion at Olbrich Botanical Gardens in central Wisconsin is a powerful example of the ability of a garden to evoke a different place and time. This landscape offers a mini-vacation to the delights of Thai culture - a metaphorical 8,000 mile journey from Wisconsin to Thailand. 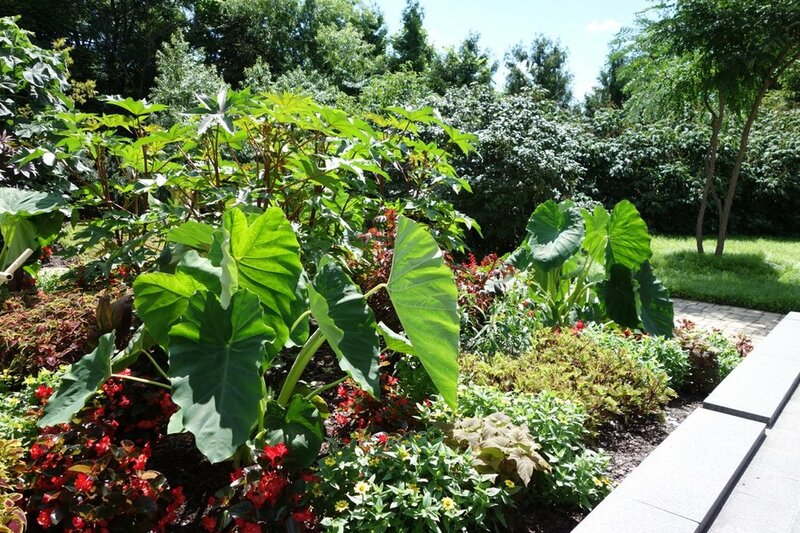 The plant-scape transports us from our local zone 4 hardiness climate to zone 12 where bold, tropical plants dominate. Exotic stone sculptures combine with historic architecture and gardening techniques to provide a window into Thai culture from the 1300’s. The elephant is the national symbol of Thailand. In Ayutthaya times, amour-ed elephants played an important role in protecting the kingdom. This planting has a gardenesque quality to it, perhaps influenced by exposure to English culture. Reaching the garden has an intentional sequence. The entrance is marked by a carved stone "Naga" - a protective deity that takes the form of five king cobra heads - surrounded by tropical elephant ear plants. This welcome invitation lets us know that something special lies ahead. A 155-foot-long, curving bridge over Starkweather Creek gives us time to slow down. This section, dark and tight, puts us in close contact with the dense tree canopy. At the end of the bridge, additional sculptures of elephants – the national animal of Thailand – guide us further into the landscape. Finally, the view opens to reveal the grand destination and focal point, a 40-foot-long pavilion covered in gold leaf. Water features reflect the structure and the sky and provide a soothing soundscape. The tropical plant theme puts particular emphasis on big and tall varieties that give the space an immersive feeling. “The Thai Garden surrounding the Pavilion emulates a lush, tropical garden with Wisconsin-hardy plants. Ornamental grasses, some reaching up to 12 feet tall, and several hardy bamboos are essential in creating a tropical look. Large-leafed shrubs and trees are pruned to give them the look of plants in a typical Thai garden,” according to the Garden’s website. Junipers pruned like clouds in a technique called “mai dat” remind me of a similar Japanese technique. A gardenesque planting might be inspired by European gardens. The Thai garden integrates Buddhist teachings, local arts, and native plantings with foreign influences that include China, Japan, and France. The Thai Chapter of the University of Wisconsin initiated the donation of the Thai Pavilion with the support of the government of Thailand. There are only 4 Thai pavilions around the world. But only this one has a Thai garden to match. The story of how this garden came to Wisconsin is equally fascinating. The University of Wisconsin at Madison has one of the largest Thai student populations in the US. When the Thai chapter of the University of Wisconsin Alumni Association wanted to share its cultural heritage with the University, it worked with the government of Thailand to donate the pavilion. Nearby Olbrich Botanical Gardens was selected as the site for the pavilion thanks to its quiet setting and proximity to water – an important Thai garden element. According to Olbrich Gardens, “The pavilion was built in Thailand, then disassembled and packed in shipping crates. The pavilion traveled seven weeks by sea, then by rail to Chicago, and to Madison by truck. Nine Thai artisans traveled to Madison to reassemble the pavilion after building it in Thailand. It took three weeks to reconstruct.” "A roof is a symbol of safety and protection. It's a way to demonstrate our commitment to the values of international friendship and peace, which form the foundation of this building," says Kim Santiago, director of international relations for the Wisconsin Alumni Association. 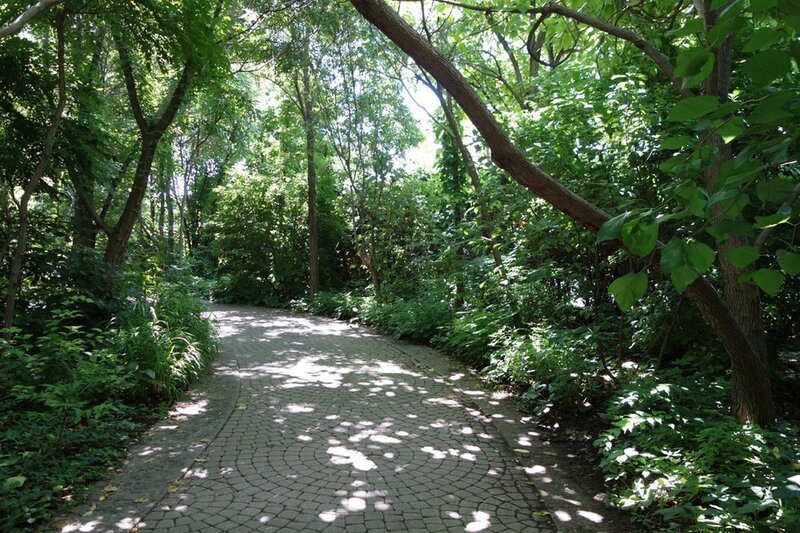 Olbrich Botanical Gardens consists of many garden spaces across 16 acres. Their mission is to “enrich life by nourishing and sharing the beauty of gardens, the joy of gardening, the knowledge of plants, and the diversity of our world.” Be sure to visit the next time you are near Madison. Do you have a garden that you visit when you want to feel like you are in another part of the world?